Toronto has been touted internationally for having a luxurious tree canopy that rivals some of the world's largest cities. According to the City of Toronto's open data, there are 569,412 trees on public streets and an estimated 9.7 million more on private land (6.1 million) and in urban forests and ravines (3.5 million). Although all of these trees provide a suite of valuable services to the City (air cleaning, cooling and shade, habitat, etc.) there is a subset of Toronto's street trees that provide an equally valuable service: free food! With the help of forestry expert Monika Oviedo, we selected, grouped and mapped the City of Toronto street trees that produce delicious (or at least edible and somewhat tasty) fruit. The species that Monika identified accounted for 22,124 trees or 3.8% of the more than half a million trees on public streets. It turns out the city is filled with all kinds of productive, fruiting species such as cherries, apples, pears, peaches, plums and various nuts and berries. Hackberries, which account for 27% (6,046) of the fruiting trees in the city are also known for being a particularly resilient species, able to grow in a variety of environmental and soil conditions, which may explain why they accounted for over a quarter of the total fruit tree species. The internet is rife with hackberry jam recipes, and if you're feeling particularly crafty (desperate), there are even recipes for hackberry wine (if the wine is half as good as the website, you're in for a treat). If you're wondering when the best time to go picking might be try using the slider on the map above to show where ripening trees are locate by the month. The chart below shows when each type of fruit tree is ripening throughout the summer and fall (although we're told this can vary significantly based on weather and subspecies). Cherries ripen first starting in June, and then mulberries, peaches and plums begin in July. As cherries end in August, pears begin to ripen alongside the peaches and plums. September appears to be the most productive month, as apples and hackberries start to drop along with pears, peaches and walnuts. The pears, walnuts (and some apples) carry through into the late fall. Overall, when looking at the neighbourhood scale, there are several particularly obvious clusters of fruit trees in the city. 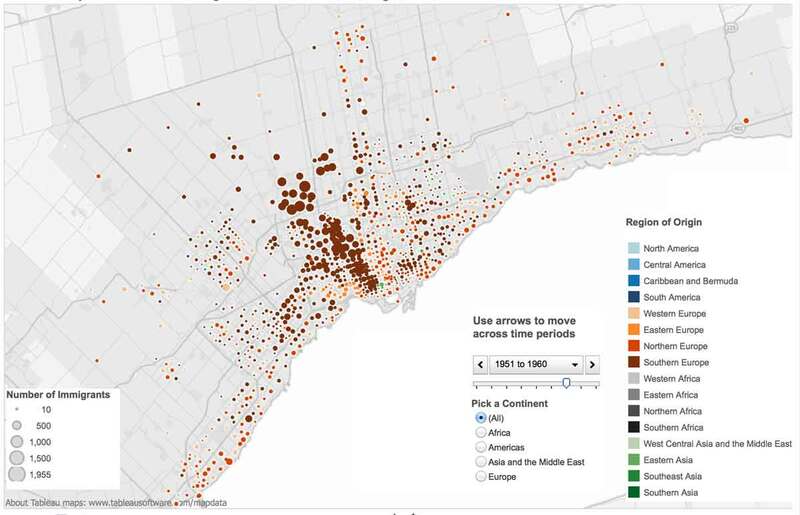 The map below shows fruit trees per hectare for all Toronto neighbourhoods (click for neighbourhood names and tree counts). The most pronounced and diverse cluster seems to be the area bounded by St. Clair Ave. West, Eglinton Ave. West, Vaughan Road and Old Weston Rd. (Keelesdale/Caledonia/Corso Italia/Oakwood Village). If anyone has any documentation around why this cluster appears where it is, we would love to hear about it, but broadly, our suspicion is that the Italian and Portugese population, historically concentrated in this area, are responsible (Rogers Road may be home to the real Little Portugal, after all). This area is home to large portions of the city's apple, cherry and mulberry trees and are really the only neighbourhoods in Toronto where you will find peach and apricot trees. Although the maps above show the location of fruit trees on public property, they are surely an indication of the distribution of these species on private property as well. The total number of trees producing delicious, free fruit in the City of Toronto is definitely significantly higher than what we've shown here. If you're interested in helping to make the most of Toronto's bountiful fruit harvest, check out Not Far From the Tree to register your tree, and they will literally do all the work while you get to keep 1/3 of your fruit (the rest is shared with pickers and community organizations). If you enjoyed this article and want to show your appreciation, we definitely won't turn down a peach cobbler or mulberry pie.